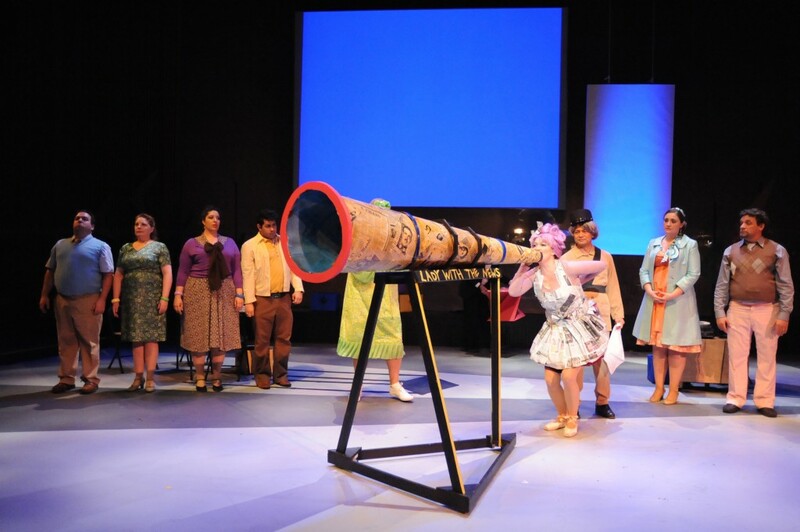 Suzan Hanson, Roberto Perlas Gomez and Chorus. Photo by Keith Ian Polakoff. 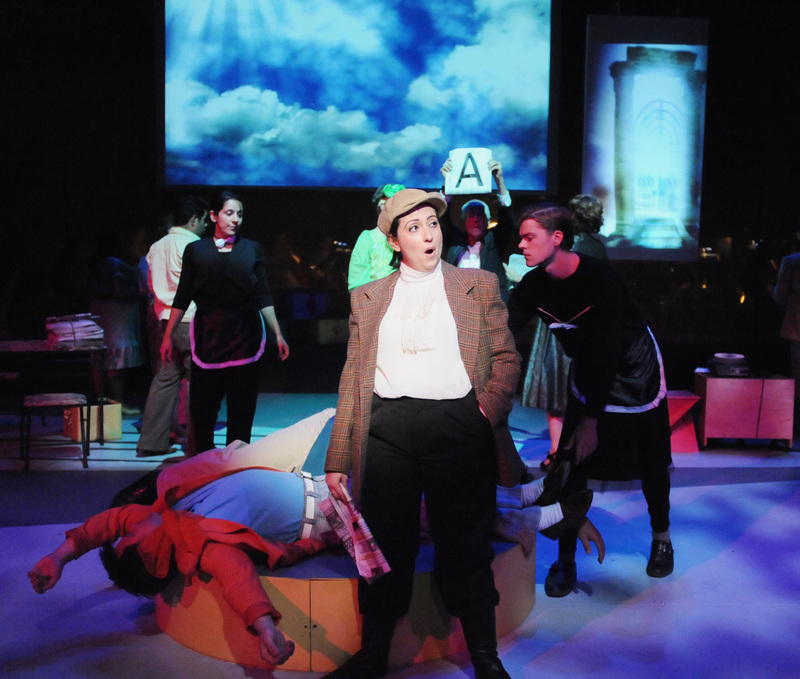 Things go crazy/wonderful in Long Beach Opera’s high-spirited productions of two short surrealist works: Bohuslav Martinů’s “Tears of a Knife” (with libretto by Georges Ribemont-Dessaignes) and Francis Poulenc’s “The Breasts of Tiresias” (with libretto by Guillaume Apollinaire). Let’s see. Whom do I love? I have a little windmill on my head that draws up these deep thoughts from my solar plexus. 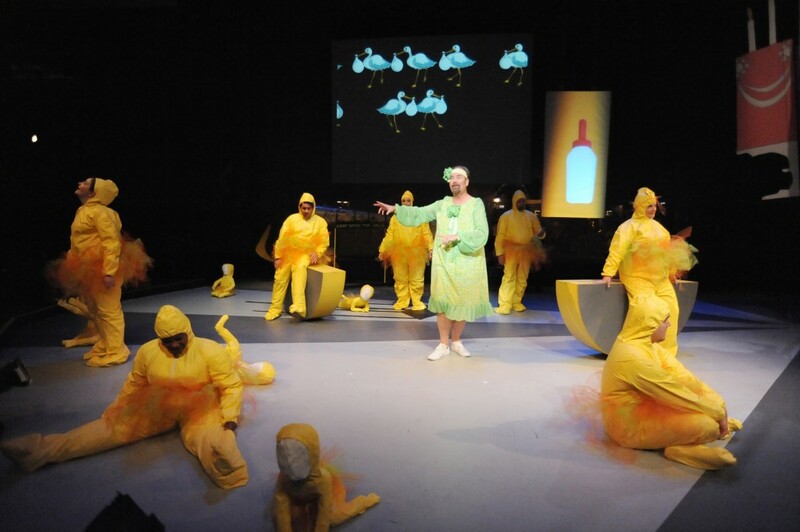 I love the Long Beach Opera because only it would be mad enough to produce a double bill of surrealist operas. Surrealist operas are distinctly different from- and-than serialist operas, by the way, although newspaper proofreaders have been known to confuse the two terms — thereby encouraging torrents of readership invective to rain down like drops of adamantine absinthe upon their music critics. I love the music of Francis Poulenc, who admired Stravinsky despite his suspicion that Stravinsky would not admire him. Poulenc wrote innumerable really beautiful songs, many of them set to texts by the poet Guillaume Apollinaire. In fact, it’s almost impossible to find a song by Poulenc that is anything less than gorgeous. His opera, “The Breasts of Tiresias” (“Les Mamelles de Tirésias’), sounds exactly like his wonderful songs and is being performed now in Long Beach. “Mamelles” sounds like “mammals,” and mammals have breasts, although “les poitrines” are a notable feature of many women in France as well as internationally. I would love to love the music of Bohuslav Martinü, but his works are not performed very often around these parts; as a result, I have not yet developed a scalding passion. The “Tears of a Knife” — that is to say “tears” as in the French “les larmes” for “teardrops” as opposed to things that rip you up — is only the second Martinü opera I have ever seen in my life, the first being the full-length “Mirandolina” at the Wexford Festival in Ireland. Wexford, like Long Beach, does unusual things (thank goodness), which is why I love both Wexford and Long Beach and am happy to have seen “The Tears of a Knife” which I most certainly would have not have done had LBO’s superb artistic and general director Andres Mitisek not decided that it was an awfully good idea and then gone so far as to conduct it with an orchestra in which only two persons (the concert master and a trumpet player) are not listed as a “principals”. You can’t go wrong when everybody is a principal. Read about these terrific principals below! I love Roberto Perlas Gomez, an excellent and amazingly versatile baritone whom I have seen in every role he lists in the program — except for his “signature” role of Figaro in “The Barber of Seville,” which must be like rolling off a log for him considering some of the astounding parts he has already tackled, the title role in Vivaldi’s “Motezuma” to name but one. I also didn’t see him in Manila creating the role of Rizal in “Rizal,” although I am willing to bet I am the only other person here to have read José Rizal’s novel “Noli Me Tangere” over a dinner of sinigang and kare-kare at the Barrio Fiesta in the Philippines. Gomez plays the hanging man in “Tears” (and is surrealistically wasted, since the role is mute), but he is also the Theater Director and Gendarme in “Breasts,” and is of course excellent — not to mention rather hilarious. Roberto Perlas Gomez, Robin Buck. Photo by Keith Ian Polakoff. I love soprano Ani Maldjian (Eleonore in “Tears” and Thérèse and Tiresias in “Breasts’). She is a truly marvelous singer and a clever instinctive actress with a lovely, clear, stable and really sizable sounding voice. I admit, however, to having been in the front row. Her breasts fly away, sort of (they are helium balloons) and, fed up with the burdens of French womanhood, she becomes a man. Her nameless husband, baritone Robin Buck (whom I also love, naturally) responds to this feminist gesture by wearing a dress and through astounding parthenogenesis, sires legions of children. Buck, who always impresses, scored in the “Tears” opera as well by being the ubiquitous Mr. Satan who has farcical powers of life and death — a necessity, really in an opera that features a young girl determined to marry a corpse. I also love Suzan Hanson. I mean, who wouldn’t? She has “been in everything” in Long Beach and hasn’t had a turkey yet, nor laid an egg (both surrealistic possibilities). She was the Mother in “Tears,” fruitlessly urging her hanged-man-obssessive daughter to marry Satan instead. He lives just next door. But, like Suzan Hanson herself in real life, Satan is everywhere and can do anything. If you read about Suzan Hanson (a super multi-talented polymath almost beyond credibility) you wonder if she didn’t write the operas as well. She is the real thing in a surreal world. Seriously. I think I have named (below) all the excellent dancers and ensemble artists who add immeasurably to the success of these operas. I cannot overlook Benito Galindo as Monsieur Presto and Doug Jones as Monsieur Lacouf, especially as they — flying in the face of an opera which like Richard Strauss’s “Die Frau ohne Schatten” wants us to all go home and start having babies — seemed, as I say against all odds and logic, to be be playing a gay couple. Whatever the case, they were welcome vocal presences with a fine sense of physical comedy. 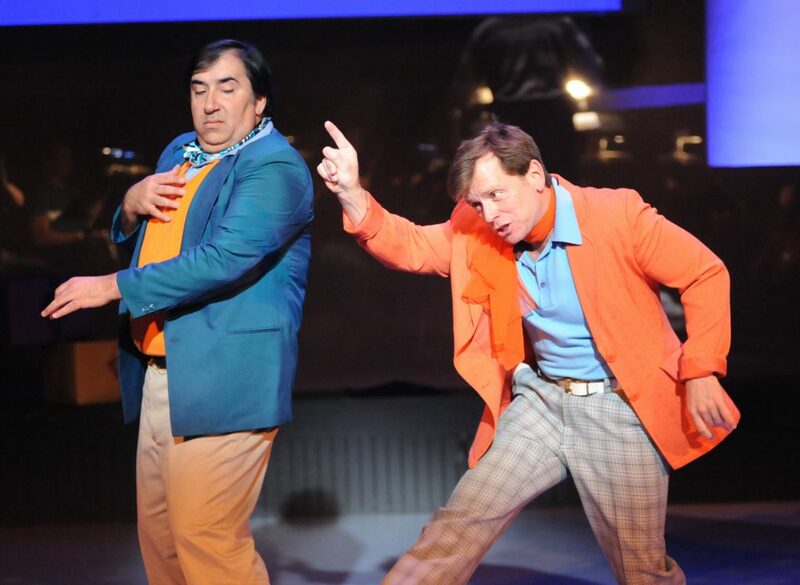 Benito Galindo and Doug Jones as Presto and Lacouf. Photo by Keith Ian Polakoff. My melting watch covered with ants tells me I have gone on long enough. I think I’ll watch Bunuel’s “Exterminating Angel” and go to bed. Robin Buck and a few of his babies. Photo Keith Ian Polakoff. Long Beach Opera Orchestra of Principals. Alyssa Park, concertmaster; Sai-ly Acosta, second violin; Caroline Buckman, viola; Timothy Loo, cello; Karl Vincent, bass; Teri M. Christian, flute and piccolo; David Kossoff, oboe; Douglas Masek, saxaphone; Todd Palmer, clarinet; Maciej Flis, bassoon; Daniel Rosenboom, trumpet; Dustin McKinney, almost principal trumpet; Stephanie O’Keefe, horn; Noah Gladstone, tenor trombone; Steve Trapani, bass trombone; Paul Sternhagen, percussion; Nada Kandimirova, piano; Timothy Loo, orchestra manager. Bravi, bravissimo!